Advantech offers a comprehensive range of 1U rackmount chassis to 7U rackmount chassis, the industrial grade multiple systems built for slot-hungry applications. For wallmount system and rackmount systems, Advantech provides this 1U rackmount chassis. Ultra-compact yet extremely powerful rackmount chassis with excellent ventilation especially designed for space-constrained applications, this Advantech 1U rackmount chassis is the best supporter for your wallmount system and rackmount system. Advantech provides this 2U rackmount chassis for a variety of wallmount systems and rackmount systems. 2U rackmount chassis is compact and highly expandable chassis with modular design for easiest maintenance; Advantech 2U rackmount chassis is the best supporter for your wallmount system and rackmount system. The HPC-7242 series is a 2U rackmount chassis designed for digital surveillance or SCADA(Supervisory Control And Data Acquisition) server applications which have high storage demand. 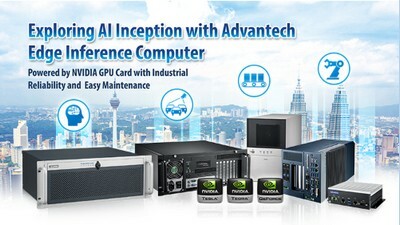 With the latest in industrial design, the HPC-7242 represents a breakthrough from the traditional, rigid concept of industrial PCs, and provides users with both a high-performance and a state-of-the-art operating platform. This series supports versatile ATX/MicroATX motherboards, with a highly efficient switching power supply and easy-to-maintain cooling fans. The series provides four SAS/SATA HDD trays, which provide a flexible solution for data storage. Other data storage options include one slim-type drive bay for optical disk drives, and two 2.5" drive bay for internal hard drive disk. The unique alarm module monitors system status such as power, HDD, temperature, fan, and LAN, to minimize system downtime. Meanwhile, system fan's rotation speed increases or decreases depending on high or low temperature inside the chassis, to minimize system noise while light system loading. A wide range of standard computing peripherals can be integrated with these chassis to accommodate robust applications in rugged environments, 24 hours a day, 7 days a week. Advantech provides 4U rackmount chassis to fit a variety of wallmount systems and rackmount systems. Our 4U rackmount chassis is the most cost-effective industrial chassis, with a complete line of backplanes, power, and storage device options. Advantech 4U rackmount chassis is the best supporter for your wallmount system and rackmount system. The HPC-7442 series is a 4U rackmount chassis designed for digital surveillance or SCADA(Supervisory Control And Data Acquisition) server applications which have high storage demand. With the latest in industrial design, the HPC-7442 represents a breakthrough from the traditional, rigid concept of industrial PCs, and provides users with both a high-performance and a state-of-the-art operating platform. This series supports versatile EATX/ATX motherboards, with a highly efficient switching power supply and easy-to-maintain cooling fans. The series provides four or eight(after adding "storage upgrade kit") SAS/SATA HDD trays, which provide a flexible solution for data storage. Other data storage options include one slim-type drive bay for optical disk drives, and one 3.5" drive bay for internal hard drive disk. The unique alarm module monitors system status such as power, HDD, temperature, fan, and LAN, to minimize system downtime. Meanwhile, system fan's rotation speed increases or decreases depending on high or low temperature inside the chassis, to minimize system noise while light system loading. A wide range of standard computing peripherals can be integrated with these chassis to accommodate robust applications in rugged environments, 24 hours a day, 7 days a week. Advantech provides 6U rackmount chassis to fit a variety of wallmount systems and rackmount systems. Our 6U rackmount chassis is a cost-effective yet fault-resilient chassis with redundant power supplies ideal for multiple-system-in-a-chassis applications. Advantech 6U rackmount chassis is the best supporter for your wallmount system and rackmount system.